Trying hard to look like Geopora cooperi . . .
How cool is this thing? (Don't "put it on a Ritz," though; it looks pretty unappetizing.) 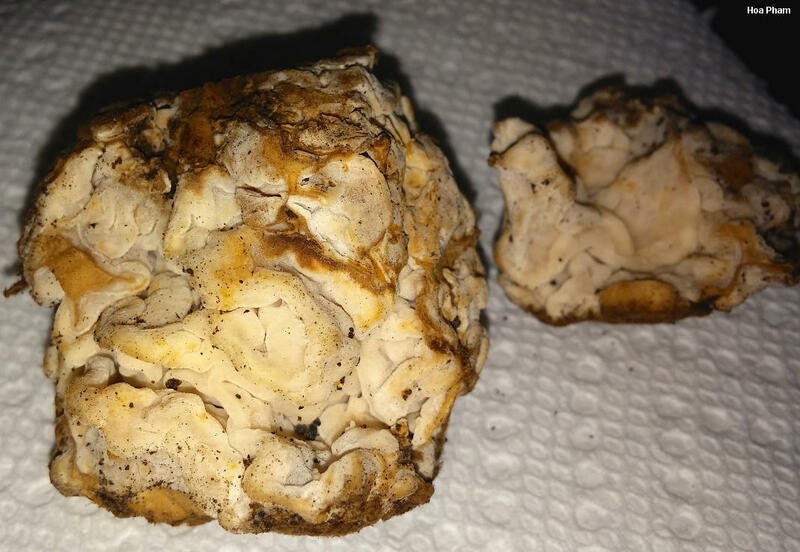 It's reminiscent of a Gyromitra--but one that swallowed itself, then got covered with a layer of fine brown hairs. Found in western North America, primarily under conifers, Geopora cooperi is "hypogeous," which is the term in Mycologese for a fungal species that has gone underground--quite literally, so that it rarely sees the light of day--leaving squirrels, other rodents, and insects as the primary agents for spore dispersal. Thanks to Hoa Pham for collecting, documenting, and preserving Geopora cooperi for study; her collection is deposited in The Herbarium of Michael Kuo. Ecology: Precise ecological role undocumented, but probably at least facultatively mycorrhizal, growing alone or gregariously, underground or partially submerged, under conifers (but also reported under aspens and eucalyptus); summer and fall; subalpine western North America. The illustrated and described collection is from Colorado. Fruiting Body: 3-6 cm across; shaped more or less like a ball or a glob; without a stem. 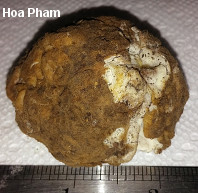 Outer Surface: Lumpy to nearly brain-like; dry; densely covered with very fine, brown hairs; medium to dark brown. Interior: Consisting of many folded, contorted, whitish layers of flesh that often have brownish edges; the layers usually touching one another, but not becoming fused; flesh whitish, sometimes staining a little yellowish when sliced. Odor and Taste: Odor not distinctive, or sour and reminiscent of bad apple cider; taste not distinctive. 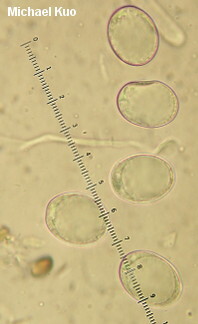 Microscopic Features: Spores 19-22 x 13.5-16 µ; ellipsoid; smooth; usually uniguttulate with one large oil droplet; hyaline in KOH. 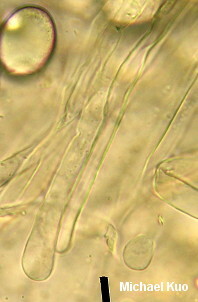 Asci eight-spored; up to 250 x 20 µ. Paraphyses cylindric with subclavate to irregularly thickened apices; hyaline in KOH; smooth; 5-7 µ wide. 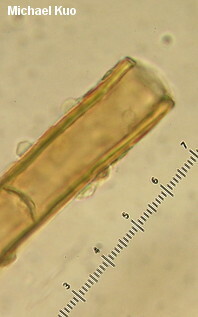 Excipular hairs 9-14 µ thick; dark brown to yellow brown in KOH; walls about 1.5 µ thick; septate; encrusted. REFERENCES: Harkness, 1885. (Saccardo, 1889; Burdsall, 1968; Smith, Smith & Weber, 1981; Arora, 1986; States, 1990; Lincoff, 1992; Evenson, 1997; Trudell & Ammirati, 2009; Beug, Bessette & Bessette, 2014.) Herb. Kuo 09031402. Kuo, M. (2014, November). Geopora cooperi. Retrieved from the MushroomExpert.Com Web site: http://www.mushroomexpert.com/geopora_cooperi.html.